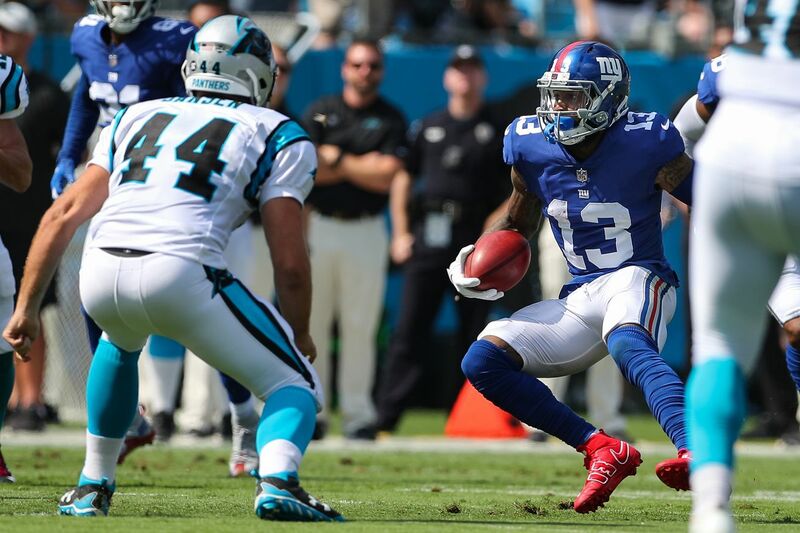 Odell Beckham: receiver, punt returner …quarterback? Odell Beckham Jr. kicked off his Week 5 with a refreshingly honest interview that broke down everything he thought was wrong with the Giants’ sputtering offense. So on Sunday, head coach Pat Shurmur gave him the chance to fix it — by playing the All-Pro wide receiver all over the field. Beckham was, as usual, the focal point of New York’s passing offense on Sunday, turning a team-high six targets into four catches for 53 yards in the first half. A reportedly “livid” Shurmur wasn’t happy to stop there. The first-year Giants coach threw him into the game as a punt returner and even as a trick play quarterback in a series of moves that certainly looked like a response to his wideout’s too-honest interview with Josina Anderson. The Giants were averaging 3 yards on 8 returns. Beckham’s ill-advised decision to try and block a Carolina gunner allowed the ball to carom off his foot. Two botched Giants recoveries later, the Panthers fell on the muffed kick in the end zone to extend their lead to 14-3. Through one half, Beckham is the only Giants player with a touchdown pass. His heave to Barkley was his team’s longest touchdown pass downfield, in terms of yards traveled through the air, in a full year. Odell Beckham Jr’s TD pass to Saquon Barkley traveled 24 yards in the air. In the second half Manning threw two key interceptions that put the Giants on the ropes, but finally got it back together enough to complete a long touchdown pass to … you guessed it. It was his first touchdown in 364 days for the Giants. So all-in-all it was an all-OBJ day for the Giants. Beckham went out of his way to challenge his team this week. Shurmur responded by giving him every opportunity he could to impact Sunday’s game in Carolina. So far the results have been a mixed bag — but with New York trailing by only a touchdown at halftime, expect Beckham to get even more touches as his Giants attempt to rally toward an upset win on the road.